Did you know that Pinterest has over 250 million active daily users? Despite some folks taking a break from social platforms like Facebook and Snapchap, Pinterest users didn’t budge. Small businesses everywhere use Pinterest to help them grow their business and increase their growth strategies. In fact, 90% of people say Pinterest gives them ideas for which products to purchase next. That’s some serious marketing potential that businesses can’t ignore. Pinterest users are actively planning for the future, which means they’re in discovery mode. These numbers show that these folks engage with branded content because they actively appreciate it. Pinterest is a place where people come to focus on themselves. Whether it’s to find inspiration, motivation for everything from a new hobby to a vacation to a new recipe. What’s unique about Pinterest is that businesses like yours play a big role in inspiring people to try and buy new things. Pinterest is actually a major visual search engine just like Google and was not formally considered a social media platform. Although they now have a social space called ‘Communities’ which is growing considerably into a huge social platform to be reckoned with. There are more than 175 billion ideas to discover on Pinterest and the numbers keep growing. Businesses have a unique and targeted opportunity to reach your niche audience with new products like Promoted Video, Shopping Ads, Business Profiles and Carousel pins. This could be the perfect place to showcase your brand and business to an engaged marketplace that’s proven they are ready to spend. The fact that Pinterest is a visual search engine represented by visual images makes it hugely appealing for potential buyers. Every idea is an image that is searched an saved and links back to websites. This is perfect for driving traffic and sales. Most importantly these visual pins help people find more information on specifically the products they’re looking for. Compared to Instagram the ability to add links is what sets Pinterest apart as a powerful marketing strategy. Adding links to pins makes it easy for a Pinterest user to find more about the product they’re looking for and potentially make a purchase then and there. Pinterest drives 3.8 times more sales than other platforms and 87% of pinners have purchased a product through Pinterest. Half of all millennials use Pinterest around the world and of its global audience 66% are female ages 25-54. If your business target audience fits into this demographic you would be wise to take advantage of this platform. The biggest interest areas on Pinterest range from Fashion/Beauty, Food, Auto, Interiors, Home, Decorating, DIY, Travel, Parenting, Finance and more. 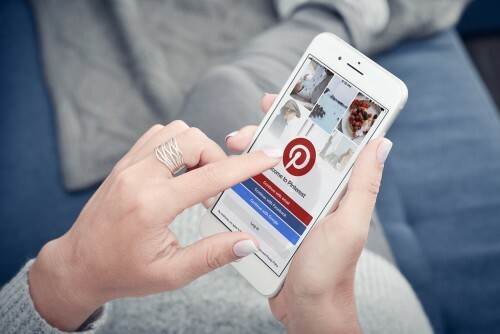 It was found that 93% of pinners use Pinterest to plan actual purchases. If you haven’t tapped into this as part of your business growth strategy you could be missing out on a huge piece of the pie! It’s easy to set up a business profile, set up boards and pins. There’s also automatic scheduling tools to put your account on auto pilot. Pinterest also has built in analytics so you can see measure the progress of your account. With over 200 million users on the platform, setting up a Business profile is an opportunity for growth your business won’t want to miss. For targeted advertising and measured success reach out to the experts at Bullseye for all your website and marketing needs.